“I like football very much. And I also love to score goals,” Nandi Nag a high school student from Miss Barker Memorial Girls’ High School said. Football is reaching the far corners of the country courtesy the legacy programme of FIFA U-17 World Cup India 2017, Mission XI Million. As the beautiful game does so often, it is also changing lives in India. One place which has been smitten by the beautiful game is a small tribal district called Khunti, near Jharkhand’s capital Ranchi. An all-girls school, Miss Barker Memorial Girls’ High School, from the village was among the many schools that participated in a Mission XI Million festival that was held in Ranchi a few weeks back. That was the first introduction of many to the game of football and they absolutely fell in love with it. However, their fascination with the game didn’t end with the festival. The girls went back to their village and determined to enjoy the game more, did the unthinkable. With some encouragement from the school administrators, they went ahead and created a football field for themselves. They now get to enjoy the game regularly. 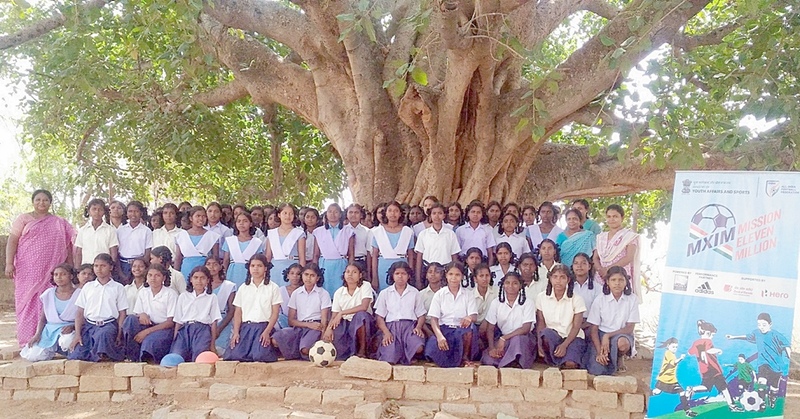 The Principal of the only girls’ school in the district, seeing the recent surge in the interest in football among her students, explains how easy it is it develop love for the beautiful game. Underlining the role of MXIM in the transformation, Mrs. P Tigga said, “Before this, no one had asked us before whether our kids are interested in playing or not. But this is a nice opportunity that we got”. Since then, there has been no looking back for the spirited young girls from the village who are thoroughly enjoying the game in their makeshift football ground on a regular basis. Commenting on the growing love for football in previously unimagined places, Project Director of LOC, FIFA U-17 World Cup India 2017, Joy Bhattacharjya said, “We had a vision in mind of taking football to every corner of the country. But the way these girls have taken that dream forward is amazing and inspirational “. Mission XI Million has already reached more than seven million children till now and hopes to take the beautiful game to eleven million children before the FIFA U-17 World Cup India 2017 begins in October.